Thank you for your interest in volunteering at Regional Animal Shelter! We are a 100% volunteer-run group! We have zero paid staff! From looking after the dogs to assisting with fundraising – we need YOU! An hour or two of your time is greatly appreciated!! Taking care of our dogs is a team effort and without the help of our volunteers, we wouldn’t exist! Come join our shelter family as we work to find all of our four-legged friends their furever home! Make a difference with as little as 1-2 hours per week! Volunteers must be 16 year of age (younger individuals 13-15 are encouraged to apply for our RASE Program) – if under 18, the volunteer must have parental consent in the form of a signed waiver and contract (to be completed on the day of training). All volunteers must have a completed application, volunteer agreement, and liability release form on file and have attended orientation, as well as training if working with the animals. Because of the limited and resources that it takes to train each volunteer, we ask that for a commitment of at least 6 months time to the shelter. We are training for all shifts, but we need the most help on weekday mornings (7-9am). We can also use assistance in photographing our adoptable dogs! We always need help with our fundraisers and community outreach – scroll down for a list of our volunteer opportunities! We need you as we are working on raising funds to take care of our animals and construct our new facility so we can help all of our furry friends! Thank you! Complete and submit a volunteer application: You will receive an email within two weeks after submission along with the upcoming orientation dates. 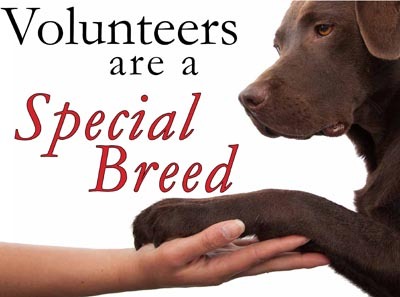 It is highly recommended that you add volunteer@regionalanimalshelter.org to your safe list. Volunteer Application (PDF) Applications can be returned to the Shelter in person, by email, fax, or snail mail. Group Orientation: We usually hold two orientations a month. The day and time varies, in order to give everyone an opportunity to attend. All volunteers with animals at home will be asked to show proof of vaccination (rabies and distemper for cats and ferrets, rabies and 5-in-1 for dogs). Please bring this paperwork with you to orientation. Training: At orientation you will sign up for your one-on-one training with an experienced volunteer. This training session usually takes 2 hours. Administrative assistant: Duties include, but are not limited to: Assisting customers, data entry, answering phones, filing, stuffing envelopes, writing thank-you notes. Fostering gives a temporary loving home for some of our animals who do not do well in a shelter environment. Foster application and home visits are required; meet and greet mandatory if there are other animals in the house. We need fosters for both cats and dogs! Fun-draising: Duties include, but are not limited to: researching animal-based grants, applying for grants, assisting with donation procurement within the community, assisting in setting up and staffing fundraisers. We meet once a month specifically to discuss fundraisers and events. This is extremely important as we not only depend on fundraising to pay our bills, but we’re also raising money to build our new facility. All volunteers are welcome to suggest and plan fundraisers, but all fundraisers must be approved by the Board. Maintenance Crew: These folks keep the shelter and yard safe and warm for the entire Regional family! Duties include maintaining the yard and fence, fixing things that break, replacing lights, and making sure shelter equipment is maintained and functioning. Shelter Supplies Specialist: Regional is dependent on donations to feed the kids, pay the vet bills, and keep the lights on! Our supply specialists help us organize drives with various organizations. We always need food, cleaning supplies, blankets, towels, and of course, treats! This is great for kids who want to get involved, but are not yet old enough to work with the shelter. This is the only position which does not require a signed volunteer contract or waiver, as nothing is done on site at the shelter. We will, however, give you documentation stating that you are collecting goodies for the Regional pups! There are three levels of volunteers, all based on time at the shelter and training. Shelter assistant – These are our volunteers who are learning how the shelter runs and how we take care of our dogs. Assistants are not allowed to handle dogs directly (unless in emergency situations) and will always be working with a senior volunteer. Assistants are allowed in the yards with the dogs only if accompanied by a shelter worker. Duties include, but are not limited to: cleaning kennels, dishes, laundry, organizing, assisting in feeding the kids (18+ limited kennel entry – calm dogs only), answering phones. All volunteers start at this level. Shelter worker – These are our volunteers who have been working in the shelter and have attended and passed a shelter-run basic skills class (offered monthly). Must be 18+. Shelter workers have all the duties of a shelter assistant, but also assume the following duties, with include but are not limited to: feeding the kids (kennel entry permitted), administering medications, walking the kids, assisting visitors at the shelter. Shelter workers can handle the kids and be out in the yard with the dogs unsupervised. Senior Volunteer – Think shelter workers, with keys. Duties include, but are not limited to: all the shelter worker stuff, assisting potential adopters, dog handling at adoption events, transport to events, vet runs, overseeing the running of the shift. Senior volunteers are expected to be up-to-date with all information about dogs in the shelter and assist shelter workers and assistants in building their knowledge base.